Kali River Rapids always has very high wait times for stand by guests during summer months, so Disney World is going to begin a test to allow for Single Riders to experience the attraction through an additional queue. From July 3 through 17 Animal Kingdom theme park will provide a Single Rider option for the popular Kali River Rapids water ride. In providing a single rider option, the ride will full all available seats and hopefully reduce the wait time a bit for stand by guests while filling all available seats on the ride. Boats are often dispatched with 1 or 2 empty seats as they can’t find guests nearby to fill the empty seats. This new option should help. I would expect it to be offered only until dusk at the latest each day as the ride has no wait during night time hours. Single Riders will be sent through the Fastpass+ line, only to be separated later on in the queue line. As with all Single Rider lines a child must be 7 or older to use Single Rider. 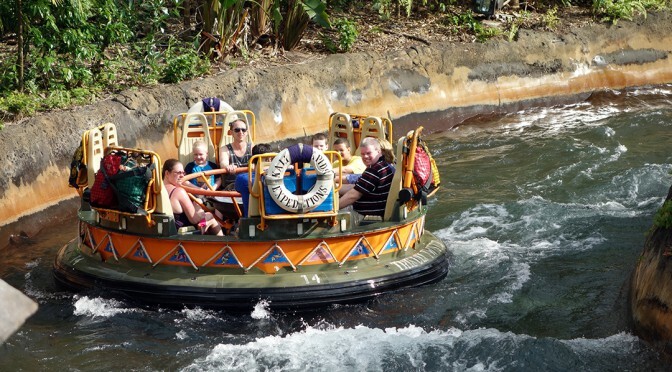 It’s a fun spinning boat rapids ride that allows guests to not only get wet, but totally soaked in the ride. Many guests wear ponchos only to find their shorts still got wet. If you need a quick cool down, I still highly suggest using Fastpass+ and one of my Character Locator Touring Plans. Previous PostBUSCH GARDENS LIGHTS UP THE SKY FOR FOURTH OF JULYNext PostWin a trip for 16 people to Discovery Cove and swim with dolphins! I think this is a fantastic idea. My husband has a bad back & I have to go on a lot of the rides by myself so this would be a real benefit for me & a lot of others, too, I’m sure.